Canada lost 45,000 of its sons (and a few daughters) during WWII. Of these 5,500 were lost in the Battle of Normandy and 359 on D-Day itself. 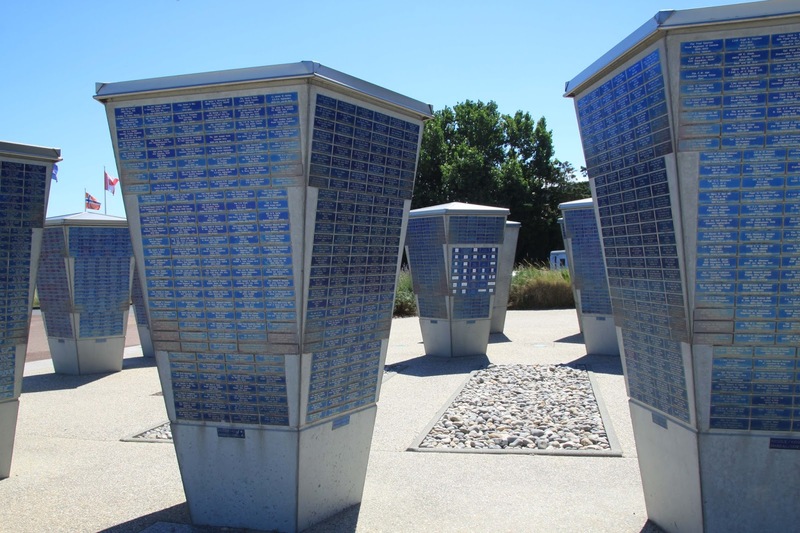 The Centre Juno Beach, founded in 2003, honors these heroes both inside the museum and out. The Canadian flag is so distinctive, it's easy to spot. They've recently built this memorial leading to the beach, and I find it incredibly beautiful. On the beach, there are still reminders, like Cosy's bunker which a plaque tells us was stormed by the Winnipeg Rifle division, which suffered 78% casualties on D-Day. During the war, this bunker would have been closer to the actual waterline (over 70 years, the coastline has evolved). We get to tour inside some of the bunkers, that were built under Nazi command with forced French labor. Our favorite story of resistance here is that the workers would put loose sugar in their pockets and thus sneak it in past the guards, where they would mix it with the cement used for the bunkers, making the cement weak and much less effective. Inside the museum is an incredibly touching film called "They Walk With You" in which the viewer is immersed as an infantry member in the storming of Juno Beach. Needless to say, Gigi and I sobbed our way through the end of it. It may just be a movie device, but it's true that you sometimes feel the spirit of the soldiers here, on the beach, walking with you. And at those moment, your heart simply fills with gratitude and pride, whether it's for the Americans or Canadians or British or Polish or Belgians or resistance fighters or anybody else who sacrificed to stand up against evil. The Canadian presence is everywhere around here. If it's not the flag flying (but it is often the flag flying! ), it's an Acadian country dance festival, with all its fleet-footed French members, celebrating northern Canadian heritage here in this little corner of Normandy. Everywhere you go, from the beach to inland, there are reminders of the Canadian heroism. But of course the French-Canadian connection goes back much further than WWII, which is why there are French Canadians in the first place. If we drive just a bit further down the coast from the Normandy beaches, we arrive at the north-shore Brittany beaches and the walled town of St. Malo. It's a sea-faring town, to say the least, and two of its greatest seafaring sons are the turn-of-the-18th- century corsaire (privateer -- like a pirate, but working for the government) under Louis XIV. And, more a propos to today's topic, Jacques Cartier, the 15th-16th century exploring who claimed what is now Canada -- at least the Atlantic coast part of it such as what is now Newfoundland, the Gulf of St. Lawrence -- for France. Cartier was the one who gave us the name Canada, actually a mistake based on him hearing the general word for villages, "kanata", in the Huron-Iruquois language, which he thought meant the name for the whole land. If you're wondering if he was better than Colombus, he seems to be. But still no saint. There were a lot of birds and natives slaughtered over several exploratory trips to the New World, some people kidnapped and many other subjugated or bilked in trading. You know, regular 16th century explorer stuff. Like Colombus, Cartier too was sure he had reached Asia. Cartier lived out his days in St. Malo. In August 2006, archeologists discovered the remains of the first French colony in France, founded by Cartier, called Charlesbourg-Royal, where the Cap-Rouge river runs into the St. Lawrence River. This was the first European settlement in Canada since the Viking village (now called L'Anse aux Meadows) confirmed to have been in northern Newfoundland in around the year 1,000. 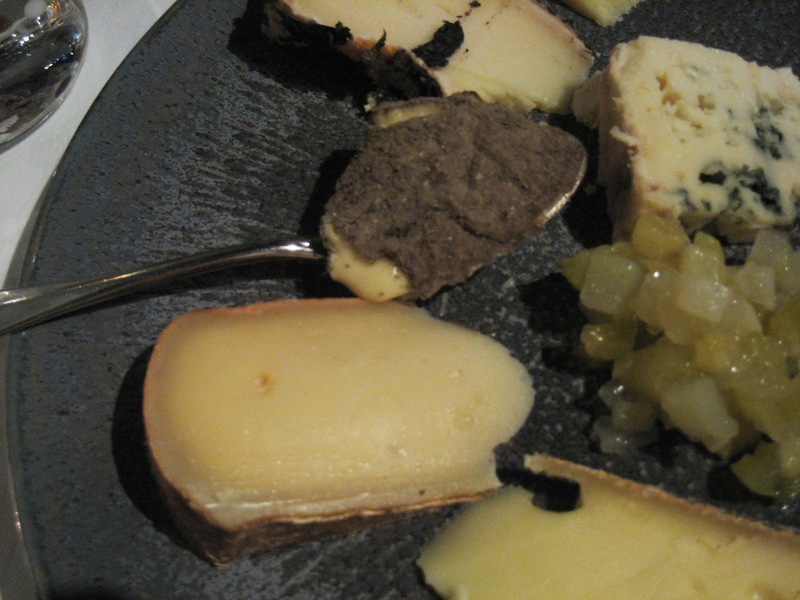 Tomme de Cidre is the big chunk of cheese in this photo, just below the spoon. It's a raw cows' milk cheese, rubbed with cidre, which is not apple cider in the New England sense (tangy apple juice) but rather in the Normandie sense (lightly bubbly, alcoholic hard cider). Of course it's a cows' cheese, because everything about this cheese screams Normandie/Bretagne: apples, cider, and cows. This cheese can also be called Tomme au Cidre and can also be made up north, in Picardie. Either way, it's a cows' milk cheese that is aged for at least 6 weeks and washed with apple cider every other day to get the crust nice and brown and solid and flavorful. The crust is thick and sturdy enough to hold in a fairly oozy, creamy hard cheese. The cider flavors the cheese in a lovely way, imparting hints of the sweetness of the apples and the zing of the alcohol. This is one cheese where I insist you eat the crust itself, as that is where a lot of the cider's flavor and funkiness reside. Delicious, and well worthy of being on one of the greatest cheese plates I've ever enjoyed (outside of my own home, that is...), at La Truffière in the 5th arrondissement. This post is in honor of Canada Day, just a few days ago. Tomme de Cidre is intimately linked with Normandy, where it's made, and where the apples for the cider grow in abundance. Here's a typical Normandy tarte, with apples of course, made by my born-and-bred Normand friend Christine. Needless to say, she is not only a fan of apples, but also of Americans and Canadians alike. 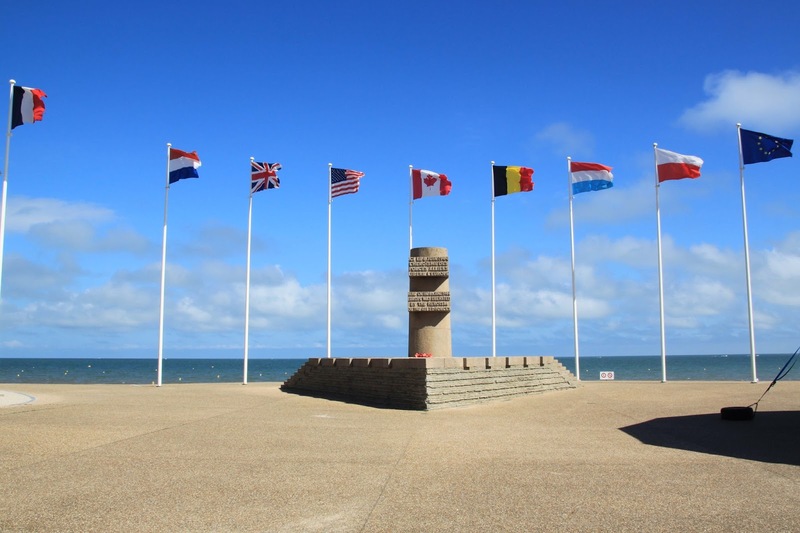 Like growing apples, the Canadian efforts in World War II are similarly and inextricably linked with Normandy, as they were the other, larges force -- besides the Americans -- to storm the beaches at the Invasion of Normandy. Further back in history, Bretagne is the area in France most closely associated with the Canadian colony. And wouldn't you know it, cider is a big thing there, too, drunk in bowls alongside a crispy, buttery brown galette (a buckwheat, savory crepe). Within the walls of old Saint Malo, Bretagne, where the great mariner statues stand, there are dozens and dozens of little creperies, and our family has enjoyed a galette at one or two of them, with a lovely bowl of cider and melted cheese oozing out.